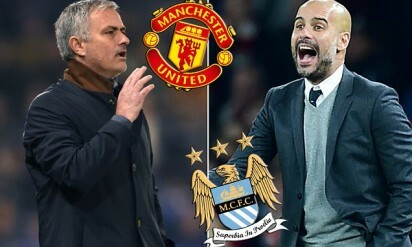 The Manchester Derby will soak up the headlines in Week 4 of the 2016-17 Premier League season, as Manchester United host neighbours Manchester City and managers Jose Mourinho and Pep Guardiola renew their rivalry. Saturday’s big derby will be all about the two managers, as Guardiola and Mourinho will finally go head-to-head once again. The two built an incredible rivalry over the course of just two years in LaLiga, guiding Barcelona and Real Madrid, respectively. While managers have rivalries all the time― Mourinho and Arsenal boss Arsene Wenger have had some heated battles over the years―there was always something particularly vicious about this particular rivalry. Mourinho and Guardiola left a year apart, neither of them seeming happy or fulfilled, both a little burnt. When Guardiola departed, he was asked about his memories of the clasicos, the biggest club game on the planet with the best players. He had seen a 6-2, a 5-0, a 2-0 in the European Cup semi-final, some of the best moments in his club’s history, but his reply was telling: “I don’t have good memories of them,” he said. In England, Mourinho has the advantage due to his familiarity with the league and the absence of Sergio Aguero, the Argentina international will miss three matches in total after an incident with West Ham United’s Winston Reid. Both teams enter the derby undefeated, so form-wise, the two sides look similar. City have mainly done damage with their remarkable attack, scoring an impressive nine goals already, while the Red Devils have conceded just one goal. Zlatan Ibrahimovic has hit the ground running at Old Trafford, same as centre-back Eric Bailly, who has been the most impressive of the summer signings so far. Henrikh Mkhitaryan is expected to see more minutes after the international break, and Paul Pogba will find his best form soon enough as well. On the opposite side of the pitch, City have endured less turnover as far as personnel goes, with the only major additions to the starting XI being John Stones and Nolito. Aguero’s absence complicates things, however―the latter could now move into a central role, or fellow summer signing Leroy Sane might be handed his first start. The former Schalke man took a short trip back to Germany at the start of the international break but has been working hard since. The game certainly is going to be a blast of excitement with goals galore. Man United should be ruling the city of Manchester on Saturday afternoon end of the game with a win. The Cherries take on the Baggies at the Vitality Stadium, keen on repeating last season’s 2-1 win. Having lost their opening two games,the Cherries were denied three points by a last gasp Scott Dann’s header as they were held to a 1-1 draw at Selhurst Park. Jordon Ibe has been underwhelming thus far since his arrival from Liverpool. Benik Afobe is also yet to get off the mark, although Callum Wilson and Josh King have both started all three games ahead of him.The Baggies started the season with a smash and grab 1-0 win at Selhurst Park which was proceeded by a 1-2 home defeat to Everton on Matchday 2, despite taking the lead early on in the game through Gary McAuley. A dreadful performance saw them draw 0-0 against Middlesbrough, which is one of the worst game of the season so far. Salomon Rondon should lead the line despite his national team involvement with Venezuela, while James McClean and Saido Berahino should provide support from the flanks. Expect a typical Tony Pulis’s kind of performance with Claudio Yacob, Craig Dawson and Craig Gardner in midfield. Danny Fletcher should provide us with some crunching tackles which will be vital against the Cherries who keep possession for larger parts of the game. West Brom love to sit back during most of their away games, and their defensive discipline could see them get a point, if not all three from the South Coast. Arsenal win, although I won’t put it past the Saints to force a draw. both at the Turf Moor. the sides, so it should be a draw. PREDICTION: BURNLEY 1-1 HULL CITY. action two months. They have lacked bite and creativity in their opening three games. Benteke. This looks like a game that could easily end in a draw. If there’s any side who looks likely to nick all three points, then its the home side. PREDICTION: MIDDLESBROUGH 1-1 CRYSTAL PALACE. any meaningful impact after coming on for the injured Kyle Walker. two games having crocked up an injury in the opening game. has the inclination as to where the pendulum’ll swing. against Bournemouth and Manchester City, its understandable. illustrious opponents. Walter Mazarri’s 3-5-2 doesn’t seem to be working, as Odion Ighalo and Troy Deeney have both struggled. further impetus in attack. It’s hard to look beyond a West Ham win. play some part in the game. Leicester City’s preferred counter-attacking strategy. Sadio Mane is fit and ready to play despite an injury scare on international duty with Senegal which should serve as a boost for manager, Jurgen Klopp. A draw seems a possible result here. PREDICTION: LIVERPOOL 2-2 LEICESTER CITY. will be seeking to exact revenge when they visit South Wales on Sunday. for a club record fee of £15m. abilities and Premier League experience. he’s bagged five goals in three appearances against this weekend’s opponents. Since their promotion in 2011, Swansea have played Chelsea 10 times in the league with a poor record of W1 D3 L6. but don’t expect the home side to go down without a fight. PREDICTION: SWANSEA CITY 0-2 CHELSEA. game prior to his howler. Hotspurs. These two sides met in May in this stadium, where Jermaine Defoe inspired the Black Cats to a 3-0 win, a defeat which cost then manager, Roberto Martinez his job, as he was sacked few days later.